Just enter your link to your blog below, Follow me on Twitter and ‘Like’ The 21st Century Housewife on Facebook. 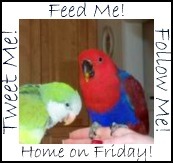 Or you can follow me at here or at The 21st Century Housewife’s Kitchen. I’ve just joined Networked Blogs, so you can follow either or both of those blogs on Networked Blogs if you like too. I will follow you back, and if you drop me an email letting me know where you have followed or ‘liked’ my blogs, I will follow you back in all those places. You can use your blog badge as your thumbnail if you wish and you can link up any time during the week. Visit as many other blogs as you like, to make new friends and follow their blog, grab their tweets and RSS feed if you do not already. If you do grab their info, please leave them a comment so they know they have a new friend. If someone visits you from Feed Me, and grabs your info, please return the favour- It’s a great way to increase your followers and promote your blog, so please pass the word around!